Sometimes we can have a requirement to display validation rule error or apex trigger error messages, on save of record in Lightning Component. We can handle those errors from apex controller and can throw messages to Lightning Component. In lightning response object though the state value comes as ERROR but the message in the error object always says ‘Internal Server Error”. 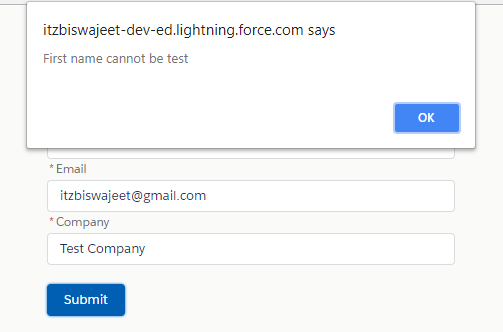 Here is an example to handle the Trigger and Validation Rule Error in apex controller to show error messages in Lightning Component. 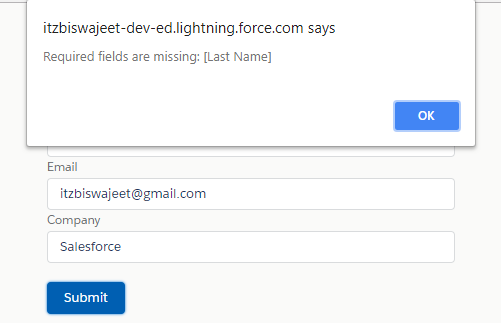 In below example I’ve used Lead object FirstName, LastName, Email & Company Field in lightning component to create record. And I’ve created a validation rule and a trigger validation on Lead object. 1. Validation rule for Company field (Company cannot be Test Company). 2. In below Trigger I’m checking if FirstName field value is “Test” then it will throw error. //Any type of Validation Rule error message, Required field missing error message, Trigger error message etc.. When we use an Apex Controller method in lightning JS Controller or Helper, sometimes error occurs on execution of apex method. In lightning response object though the state value comes as ERROR but the message in the error object always says ‘Internal Server Error”. Here is an example to handle the apex exception and how to show custom messages in Lightning Component. In below example I’ve used Lead object FirstName, LastName, Email & Company Field. 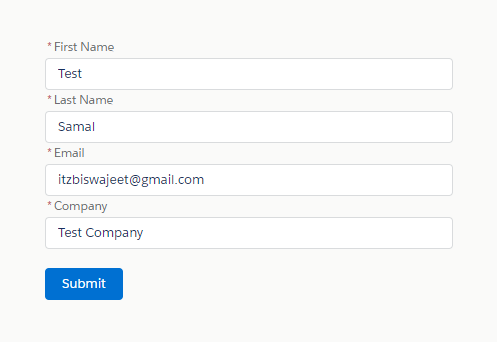 In lead object LastName & Company fields are required. 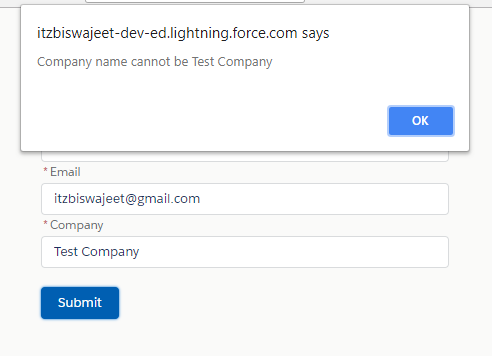 If we will submit the form without the required fields, then the apex method will throw the error message, which we can show in lightning component or we can add our custom message there.